I am a 51 year old male who spent 25+ years working a computer job, had zero interest in exercise, and ate to relieve stress, boredom, and because I really, really, like food. Over the years I went from wearing a size 36 pant to wearing a size 38, to wearing a size 38 with an expanding waist band, and finally wearing a size 40. Ok.. a size 40 with an expanding waist band. I was 5’10, 240 (ish) lbs, obese on the BMI scale, and winded taking two flights of stairs- and was not phased by any of it. I looked in the mirror regularly, saw the same charming, extremely good looking, and modest guy I’ve always seen, and continued ordering fries with my lunch. Dr. Oz ruined it for me. Dr. Oz convinced me the fat around my belly was bad. And, he had a plan- walk 10000 steps a day, it’ll make you lose fat. He had a lot of other advice on supplements, eating right, etc., but I pretty much zoned out after the walking bit. I ordered “You on a Diet” and the “You Workout.” and.. failed. Even the beginner workout was overwhelming. I couldn’t get through the 20 minute Pilates and stretching type workout without pausing the DVD to breath, and then couldn’t do half the stretching moves fully. I needed the dreamer workout, not the beginner one. In December 2012 I finally started hitting my 10000 step goal. For me, seeing the number on my device was important, a fuel gauge doesn’t cut it. Having to look at my phone is too delayed. The app is nice, but get a numerical display. 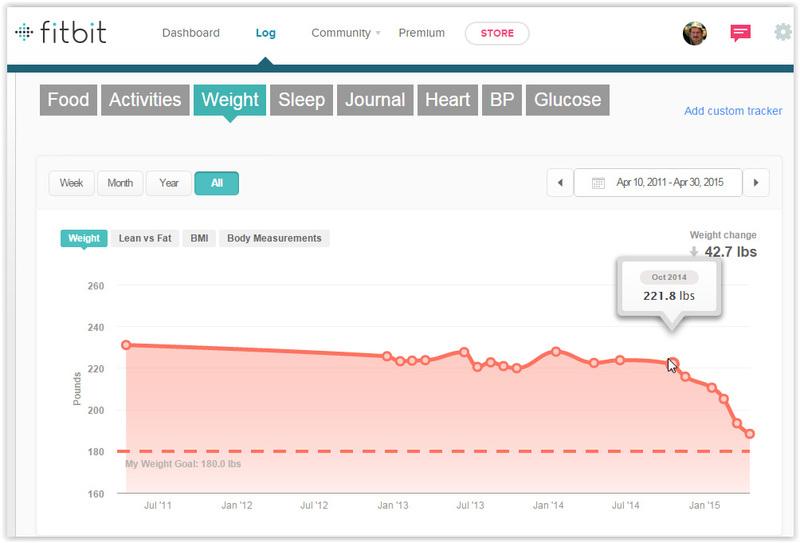 The Fitbit site has great charts, great history tracking, and ways to add your friends and compete! I bought a Fitbit. I am, it seems, the only human being to watch TV or actually eat at McDonald’s. I have given impromptu surveys, and can’t find anyone who watches more than a few hours of TV, or has EVER eaten at McDonalds. If, however, you, like me, like to watch TV- use that as an excuse to workout. Get an app, download your program to your phone, tablet, etc.. and only watch when you workout. This is harder to do while walking outside without walking into a tree, so probably you should confine the use of workout TV to the gym. I started walking 5 miles a day, almost every day, two years ago. I started jogging some of that along the way. I walked over 3 million steps in 2013, 3 million steps in 2014, and lost roughly (tada) zip, nada, nothing. Damn you and your lies Dr. Oz! I’m not complaining, though, because I didn’t add any weight over those two years, either, and I improved my overall fitness. I no longer got winded going up stairs, could walk / jog (WOGGING™ is a trademark of Byron Ferguson Fitness Enterprises), and go up and down the stairs without holding the banister. Here are some potential reasons I didn’t lose some weight at the same time: I ate more because working out made me hungrier, I added muscle mass (ha! ), I figured since I was working out I could eat stuff that was a little worse (ouch, painfully true), or my average workout burned only burned 300 or so calories. The truth is, if you really need to lose weight, you’ve got to pay attention to the food you eat. I knew that, I just did my best to prove it wasn’t true for two years. Two years not much progress on weight loss. October 2014- Started paying attention to food. Advice 6: Eat a little better, rinse, repeat. 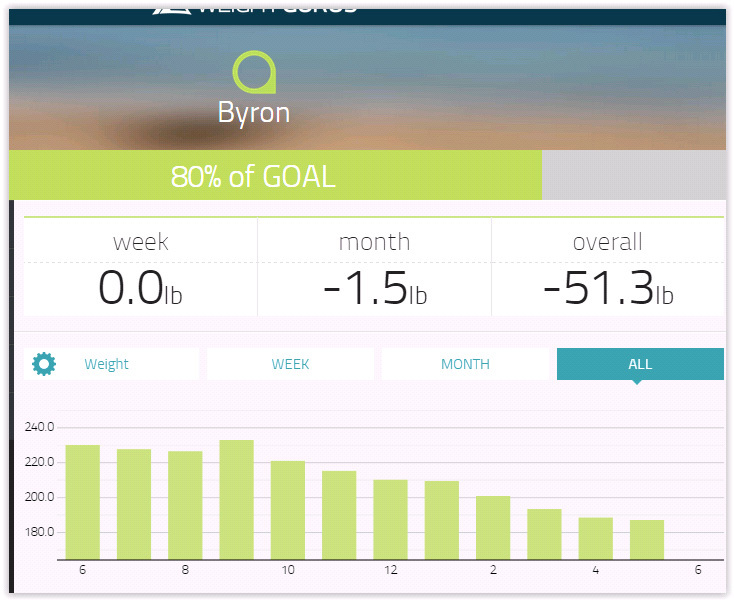 Shortly after I started paying attention to what I would eat using the MyFitnessPal app, I joined the Whole Life Challenge with my sister ( https://www.wholelifechallenge.com/.) The challenge encourages different eating habits, and has different levels. The simplest level asks you to cut out bad oils, sugar as an ingredient, bread and pasta, beer, soda, diet soda, chips, fries, and a few other foods. (What the heck is left!) While doing this “cold turkey” might be challenging (not hard- cancer is hard, not eating something is not hard -WLC), try cutting ONE thing out for ONE meal. If I gave you $100 to not have soda for one meal, could you? Of course! One meal is EASY! Now just do that three times and you’ve done it for the day. Good? Try two days. Say to yourself, “I have had ______ all my life, I can not have it just this once.” Got the soda down? Do the same for fries. (OMG I love fries!) Keep making small changes and eventually you WILL see a huge difference. Advice 7: Fail quickly, rinse, repeat. Once I started really paying attention to food, I bought a scale and logged my weight. I set my goal high- lose just one pound. Not 75 pounds overall. Just one pound (Really I wanted to lose all 75 pounds in one week but that seemed just a little unrealistic.) At the end of one week I had lost one pound. Winning! Two days later I had gained four pounds. Fail. 🙁 I started again. This time I lost two pounds. Obviously your weight is going to fluctuate daily, but weighing myself daily did three things for me. First, weighing daily made it impossible for me to hide going off the rails at that all-you-can-eat country buffet. Second, not hiding from the scale made me plan how I could go off the rails less (not less times, but like only going back for seconds ONCE at the buffet. Finally, this eventually made me go off the rails less FREQUENTLY! A way to measure, even an imperfect one, allows us to correct course and head in the right direction. Way off the rails in September. Restart. May looking a little rocky. Focus. I’d like to think I’m too smart to fall for simple tricks, but the truth is I’m easily swayed. Here are a few mind tricks that made me make better decisions. If people ask me if I’m losing weight I never reply with “I’m working on it,” “so far,” etc. I say, “Thanks for noticing,” or better yet- “Only 20 more pounds to go.” Trying implies failure is still an option. There is no try; do or do not! At least tell yourself that. Also, stop telling yourself losing weight, working out, … is HARD! The Whole Life Challenge tricked me well by saying, “Cancer is hard, living a healthy lifestyle is EASY!” Tying hard to cancer made it impossible for me to whine to myself.. “it’s hard.” Finally, one last trick- when you’re at a meal and want those french fries, garlic toast, or other food non grata (not to be confused with au gratin,) remind yourself, “I am not a wild dog that has to eat everything someone puts in front of me. Just this once, I can not eat this.” I know, you’re thinking these are all silly word games. Words don’t matter. I’m not saying these. Yep. You’re right. Don’t say them. Don’t think of them. Oh, and don’t think of pink elephants today, young padawan. I wore my size 38 expanding waist pants as long as my wife would let me. After she started calling me homeless man, I finally had to bite the bullet and start buying clothes. I hate buying clothes. I would much rather give my money to an obviously faking homeless guy. I could slowly transition, switching, as laundry required, between clothes that fit and don’t fit until I finally hit my target weight, or I could go all in. I went all in. I donated nearly my entire closet to Goodwill. My wife asked, “what if you put the weight back on?” I have in the past kept the old clothes, finished twenty pounds or so, and then put it all back. This time, however, I’ve made a full commitment. I’m not going back. The bridge is fully burnt. If I do go back, guess I’ll have to parade around buck ‘nekid. Nope. Not going back. The biggest problem with every other “diet” I’ve tried is that it was a diet. Oh, I told myself occasionally that I was doing a lifestyle change, but in truth, I knew it was a diet. The more weight I lost, the more likely I was to cheat. I’ve lost some weight, I’m entitled. My changes have started much slower this time, but every change I’ve made is something I can live with, and feel I HAVE to live with, forever. I want to eat more real food, and less boxed stuff. That’s not a diet, it’s a decision. I want to eat less (or no) fried food. That’s not a diet, it’s a decision. The other problem with a diet was that after it was done, I was done. Now I can go back to eating fries, etc- until I finally have to diet again. This time I’ve made decisions that I will do forever. And now, I don’t have to be done. That change makes all the difference. I might be wrong. Really. If it doesn’t work, dump it. If you keep doing what you’re doing you’ll keep getting what you already have. I’ve gotten so much help from others online, I hope my story and advice will help someone. Want to be my fitbit friend, email me telling me how much this helped? My email is byron@byrini.com, and may the force be with you! Byron Ferguson is a professional “computer guy,” who likes performing magic, building stuff, cooking, and hanging out with his family. He does not like to exercise, but it a necessary part of his master plan to live forever. So far his plan is going swimmingly. Byron currently lives in Parker, CO with his wife Toni and their two kids Nolan and Kyra. I ran two marathons, including a runDisney coast-to-coast ultra in memory of two fallen firefighters. 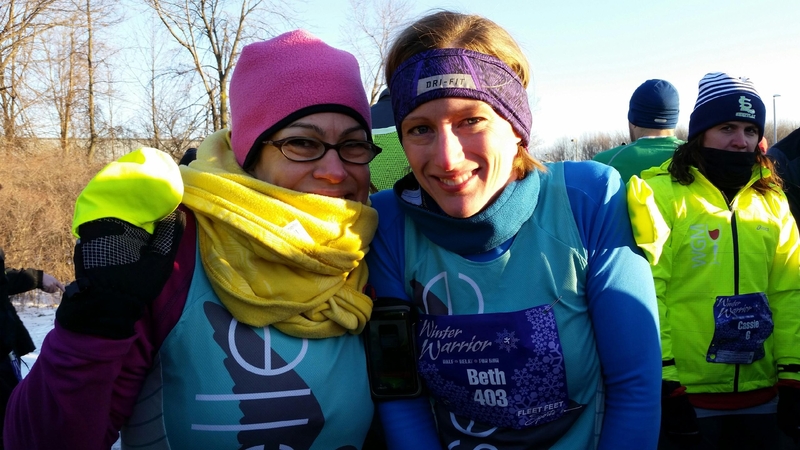 I PRed in nearly every distance and became an Oiselle team runner. I covered several high-profile trials at work and for the second straight year, ran more than 1,000 miles. Honestly, I am still trying to figure that out. I have several spring races planned and I would like to run a fall marathon, but I also want to do something new and different. What? I’m not just sure. I need to work on my core, and not make excuses when I’m not in the mood or the weather makes travel difficult. I need to drink less coffee and more water. I need to clean put my closets, become more organized and purge unnecessary items with a mass decluttering. I need to step out of my comfort zone and try something new. I need to be better about living in the moment, and just go with it. So I plan to live by this mantra in 2014, live each day better than the day before. If I follow that plan, I can’t go wrong. What suggestions do you have for my coming year? What should I try? What are your 2014 goals?